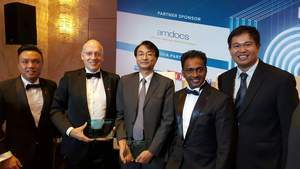 SINGAPORE--(Marketwired - Jun 17, 2015) - Arkadin, an NTT Communications Group company, and one of the largest and fastest growing providers of Unified Communications and Collaboration services, has been recognized as 2015 Frost & Sullivan Asia Pacific Collaboration Service Provider of the Year. Frost & Sullivan analysts cite Arkadin's transformation as a leading player in the highly competitive Unified Communications-as-a-Service (UCaaS) market as a critical factor in its selection. "The synergies between Arkadin and NTT Communications are leveraged extensively here in Asia and throughout the world," says Jessie Yu, Industry Manager, ICT Practice of Frost & Sullivan. "We're impressed with the breadth of their UC&C portfolio and the way they've structured their marketing and customer engagement strategies to broaden their reach quickly in Asia Pacific. This has helped increase new customer acquisitions by more than 50%, with many in the coveted enterprise category." "This award is a testament to the success we're having with our main growth drivers, which focus on enterprise customers, product diversification, UC and synergies with NTT Communications," says Serge Genetet, Arkadin Executive Vice President - Managing Director, Asia Pacific. "These drivers are essential for our transformation from a conferencing provider to a market-leading UC&C powerhouse." See video. Frost & Sullivan also cited Arkadin's enormous success in enriching the ArkadinAnywhere web conferencing solution for a true, cost effective service, and its continued leadership and expansion in video collaboration services through its partners Vidyo and Blue Jeans. Serge Genetet accepted the award which was presented at Frost & Sullivan's 2015 Asia Pacific ICT Awards reception at The Westin, Singapore. Arkadin is one of the largest and fastest growing Collaboration Service Providers in the world. Our collection of market-leading audio/web/video conferencing and Unified Communications solutions enables enjoyable collaboration experiences that are essential to success in a digitally connected global workplace. As an NTT Communications company, our services are delivered in the cloud and backed by a cutting-edge infrastructure for premium service quality. Over 37,000 customers spanning the largest global enterprises to small businesses are supported locally in 19 languages through our network of 56 operations centers in 33 countries. For more information: http://www.arkadin.com. Sean Kwek, Regional Arkadin VP and Serge Genetet, Arkadin EVP - Managing Director, APAC accept the Frost & Sullivan award with Takeshi Kazami, President and CEO, NTT Singapore; Michael Goh, Director, NTT Singapore and Manoj Menon, Managing Director Asia Pacific and Senior Partner, Frost & Sullivan.